I’ve been on a quest this winter to find the most beautiful destination to explore in backcountry Banff National Park and I believe I may have just found it. I just took a 3 day mixed ski and snowshoe trip into Brewster’s Shadow Lake Lodge with my family and discovered a lake so stunning, I might just have to say it’s the “most beautiful backcountry lake” in all of Banff National Park. It’s a bold claim I know, but the photos below don’t lie. Shadow Lake is most easily accessed via the Red Earth Creek Trailhead, located 12 miles west of the town of Banff. The Red Earth Creek trail itself is a 6.5 mile cross-country ski, snowshoe or hike on an old road that is easy to follow. The trail averages a 3.2% grade and offers a pretty good workout on the way up to the junction with Shadow Lake. Most people bring skis for this part of the trip because you can make it back to your car in a fast hour on the way down and it’s not really all that exciting to snowshoe an old road. 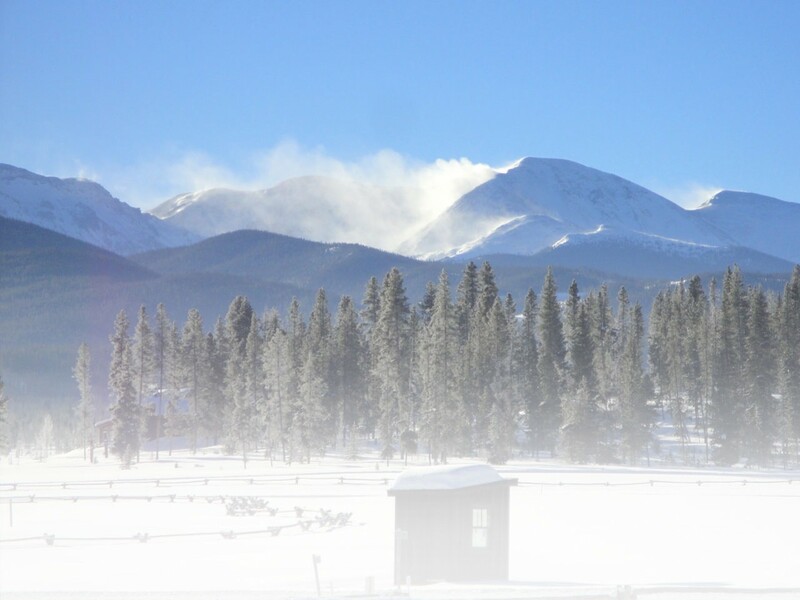 From the end of the Red Earth Creek Trail, it is a final 1.5 mile hike or ski to Shadow Lake Lodge and it doesn’t matter if you are skiing or snowshoeing here because everybody will be walking on the initial climb up from the junction. On our recent trip to Shadow Lake, we chose to spend two nights at the remote but very decadent Shadow Lake lodge so that we could take our time fully exploring the area rather than rushing in and out in a long day trip. We also wanted to give our six year old son a rest day after the long journey to the lake. We knew he wouldn’t appreciate the beautiful surroundings we were in until he’d had a good night sleep, some solid food in his belly, and had restored his energy for more exploring. We chose to walk the first couple miles of the trail with micro spikes on our boots because we hadn’t had a lot of fresh snow here and the trail started off steep and icy. We then switched to cross country skis that we had been carrying strapped to our packs and put on our ski boots that we’d been pulling in an old sled. In hind sight it would have been a lot easier to have carried the spare boots rather than pulling that darned sled up and down the trail! We completed the final 1.5 miles to the lodge on foot again with skis strapped back on our packs and managed to make it in time for afternoon tea and cookies, which as you can imagine was our son’s sole motivation by the end of the trip. We managed to ski more on the way out but still walked the upper section until we’d finished with the steep icy hill down to the main junction and trail. Once at the lodge, we settled in to eat, sleep, and explore on snowshoes that we borrowed from the lodge. We brought our son’s junior-sized snowshoes in with us but we knew we didn’t have to bring ours in (saving at least one extra thing we wouldn’t have to strap to our packs.) If, however, you are partial to your own snowshoes I would still recommend bringing your own. The lodge has a dozen pairs or so to borrow but sometimes it’s more fun to explore with familiar gear. Perhaps the best thing about staying at Shadow Lake Lodge is the fact that you won’t have to lift a finger to make meals, do typical “hut chores,” or even clean during your stay at this backcountry resort. The only work you’ll be doing during your stay is to make your daily lunch following breakfast each morning. Even then though, everything is sliced and ready to go for you to assemble a quick sandwich, bag some cookies and granola, and stuff it all in your day pack. This is how you can expect to spend your time at Shadow Lake Lodge – Relaxing! The meals at the lodge are hearty and scrumptious at the same time. Breakfast on our second day included not only a baked egg dish with spinach and tomatoes but also bacon, blueberry and strawberry pancakes, and hash brown style potatoes. There were freshly baked scones along with fruit salad, oatmeal, and yogurt as well so it’s fair to say nobody leaves on their day’s adventures hungry. As for dinners in the evening, you can expect pork tenderloin, roast beef, or chicken along with freshly steamed or roasted vegetables, a green salad, and rice or potatoes on the side. Dessert tops it off with one decadent cake or another. We even had Crème brûlée our second night. There are several backcountry lodges in the Canadian Rockies but what really sets Shadow Lake apart are the accommodations. Every guest sleeps in a private log cabin with choices of king, queen or double beds. Ours had two queen sized beds which was perfect for our little family. The cabins are propane heated with solar power lighting and it doesn’t get much more comfortable in the backcountry. The lodge also boasts showers and running water in their bath house which is pretty rare to find at a backcountry lodge. This was our second time staying at Shadow Lake Lodge as a family and once again, it did not disappoint. Service, food, and accommodations were all top notch and of the highest quality. The easiest adventure from the lodge is to nearby Shadow Lake. It is a fifteen minute hike from the lodge and access is across a flat meadow following a scenic creek. We enjoyed this outing because we were able to hike across the gorgeous frozen lake to the far back end where we found a secret bowl you’d never see in summer at the base of splendid Mt. Ball. Most of the other lodge guests chose to wander around the lake as well and we were pleased to see that others had also chosen to ski in, but to explore the area on snowshoes from the lodge. We stopped often to make snow angels, to play in the snow, and then had lunch at the back of the lake. A lovely loop could be made of the whole lake and at a leisurely pace it was a good half day outing. This left lots of time in the day for afternoon tea, reading in the communal fireplace cabin, a game or two of cards, and opportunities to chat with other guests on the sunny cabin decks. For more adventurous explorers, there are two mountain passes, Ball Pass and Gibbon Pass, that can be visited in a day trip from the lodge and snowshoes definitely make these journeys more accessible for the average outdoor enthusiast. Scenic Haiduk Lake can also be visited in a day’s outing from the lodge and is a popular extension to the shorter Shadow Lake hike. No matter where you decide to explore, lodge staff is on hand to help with suggestions, and most trails are well packed down in winter by other visitors. There is also little to no avalanche danger if you stick to the main trails while at Shadow Lake Lodge, which I found to be comforting. For more information on Shadow Lake Lodge, visit their website where you can find everything you need to know about their rates and operating season, make reservations, and even find a detailed map of the area. Summer at the Lodge is also an amazing experience and advanced reservations are recommended. Planning a trip to the Canadian Rockies? Find more information here to help plan your trip from Banff Lake Louise Tourism and Travel Alberta. Big thanks to Brewster’s Shadow Lake Lodge for assisting with this trip and for making our stay possible. This entry was posted in Adventure, Après-snowshoe, Destinations, Features, Homepage Featured, News by Tanya Koob. Bookmark the permalink.